According to him, no amount of punitive actions would solve the challenges of poor sanitation, environmental degradation and endemic corruption in the Ghanaian society except and unless citizens, particularly Christians decided to have a change of attitude. 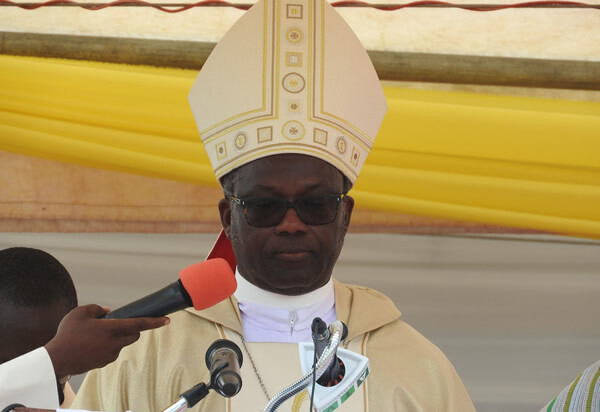 Bishop Fianu who was speaking at the diocesan launch of the Ghana Catholic Bishops’ Conference project dubbed, ‘A Clean Environment in a Corruption-free Society’ on Wednesday 12th December 2018 at the St. Cecilia Parish in Ho, charged faithful to impact society with their faith through self-sacrifice, love and service. “As Christians, we should let our faith impact our public life. We should witness to Gospel values in our public life,” he stated. The programme which is under the auspices of the Diocesan Good Governance, Justice and Peace Commission, according to its chairman, Rev. Fr. Clemence Ashiara will adopt effective and pragmatic strategies to address poor sanitation, the abuse of the environment and endemic corruption; and as well enhance the capacity of the priests and lay faithful to engage and support the local authorities in the search for accountability and development. Outlining some strategies to achieve the objective of the project, Bishop Fianu entreated individuals and households to keep clean at least 50 metres radius around their homes, churches and institutions. He urged the faithful to wary the dangerous effects of poor sanitation especially open defecation on the individual’s health and the environment and thus, advised that homes and institutions should construct places of convenience in their premises. He also proposed the celebration of the ‘Abor’ (Garden) Day in the schools, for children to be groomed for planting and nurturing trees in the surroundings. “We must educate ourselves about the negative effects of e-waste and to seek appropriate ways of disposing them” the bishop added. On his part, the Deputy Volta Regional Minister, Mr. Maxwell Blagodzi who represented the minister at the launch, lauded the bottom-up approach of diocese to tackle the poor sanitation and corruption menace, which he noted has caused the country to lose both financial and human resources needed to propel rapid socioeconomic development. He emphasized that the fight against corruption should not be left in the hands of only those in leadership positions, but rather, “followers must understand that they wield a great power in the fight against corruption". The deputy minister also added corruption should not only be seen as the use of public funds for private but also a total deviation from acceptable ways and principles of religious beliefs and the national law. An official from the Regional Environmental Health Department, Madam Stella Kumedzro, underscored the need for everyone to good personal and environmental hygiene in order to prevent diseases and also save the country the over 290 million dollars it loses annually as a result of poor sanitary practices. She disclosed that Ghana’s sanitation record worldwide was very poor as it is among the ten countries with poor sanitation and ranked the 7th dirtiest country globally. In the Volta region, madam Kumedzro stated that, only 414 communities, representing only 15 per cent of over 3000 communities were open defecation free, and called for a concerted effort to tackle it. Mr. Joseph Nkrumah, Regional Manager of the Ghana Water Company said the environmental degradation has reduces the quality of raw water and increases the cost of treatment by the company, and thus backed the project which will ensure the protection of the environment, including water bodies. A Senior Programme Officer at the Environmental Protection Agency (EPA), Mr. Derick Logo, called for a fine balance between economic gains and environmental management so as to ensure a good and sustainable environment for posterity. Present at the ceremony was the Vicar General, Very Rev. William Horlu and a host of priests, religious and lay faithful from parishes within the Ho deanery as wells other stakeholders.